We ask our MLNPstars to share with us how they like to spend their earnings, so that we can share it with you. We’re delighted that MrandMrsLau chose to donate their earnings to a cause very close to their hearts. Read on to learn more about the inspiration behind MrandMrsLau’s generous gift. “My 7 year old son’s best friend has an autistic brother. This little boy has been on his death bed quite a few times and it has caused a lot of distress for his amazing parents and siblings. At the moment he is doing really well. He got a puppy from his parents and it has really changed him for the better. That bond between him and his dog and seeing how his face lights up when he’s with the dog prompted us to want to donate our MLNPstar earnings to Canines for Disabled Kids. We really wanted our donation to benefit children because being born into a difficult situation is something they have no control over. 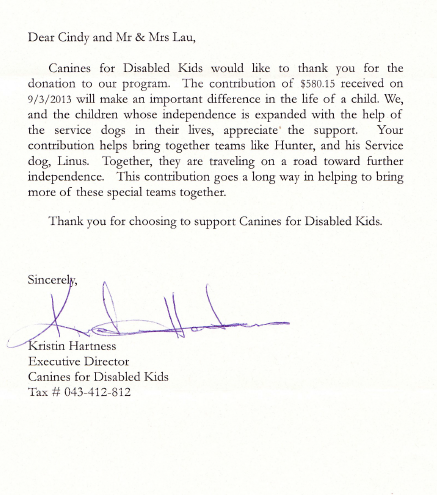 We think Canines for Disabled Kids is an amazing program and we hope that more Americans will get behind them so that they can enrich the lives of more little angels. What would you do with your MLNPstar earnings? Learn more about what our MLNPstars have done in our #realworldinbox.